CliClap | AI-powered autonomous lead generation and qualification - Brace Yourselves, Marketers. Summer is Coming. Brace Yourselves, Marketers. Summer is Coming. Marketers, summer is coming and it’s knocking on the door of our office, holding out promises of beaches, hotels, or chilling out with Netflix, a pint of Ben and Jerry’s, and a spoon. Or maybe that was the kids banging on the door, demanding those promises for the (too many) days that they’re on school vacation. Either way, summer is prime time for things other than work. You could pay your debts; Lannisters always pay their debts. Between the planned vacations and the unplanned distractions, it’s hard to keep your business’s sales funnel flowing as smoothly as you do throughout the rest of the year. That feels reassuring. It means that if your sales funnel isn’t managed 100% over the summer – not to worry! – you probably won’t lose much business. The problem is that assumption, more often than not, isn’t true. We’re going to take a look at two factors that keep summertime an active business time for B2B. Then, since you or your employees might actually want to take a vacation over the summer, we’ll give you a game plan on how to prepare in advance so your sales funnel doesn’t have to go on vacation with you. If you are around and experiencing slower business, it might be the perfect time to do some spring cleaning around your data, tools and analytics. We’ll provide you with a game plan for that too, so you can make the most effective use of your time. Remember the classic line: “I need a vacation to recover from my vacation”? It’s all the truer today when people are simultaneously on vacation… and yet not on vacation. We’re all connected, all the time, everywhere. We go to a resort, and the laptop, tablet, and smartphone come along as guests. And since you have them, of course, you’re expected (or you expect yourself) to handle some work here and there. Which means that as soon as your B2B customer takes her post-beach shower, she might sit down in the lounge chair on the hotel terrace and start looking for information about you and your offering. Until they invent “vacation mode” for devices that only lets leisure-related items through (startup idea, anyone? ), you have to assume that most of your audience is still around and at least semi-active. When does “summer” officially start? If you’re in the USA, school summer vacation might be from late May to early August or from late June to early September. In the UK, it’s from mid-July to early September. Singapore takes a four-week summer break from late May to late June. 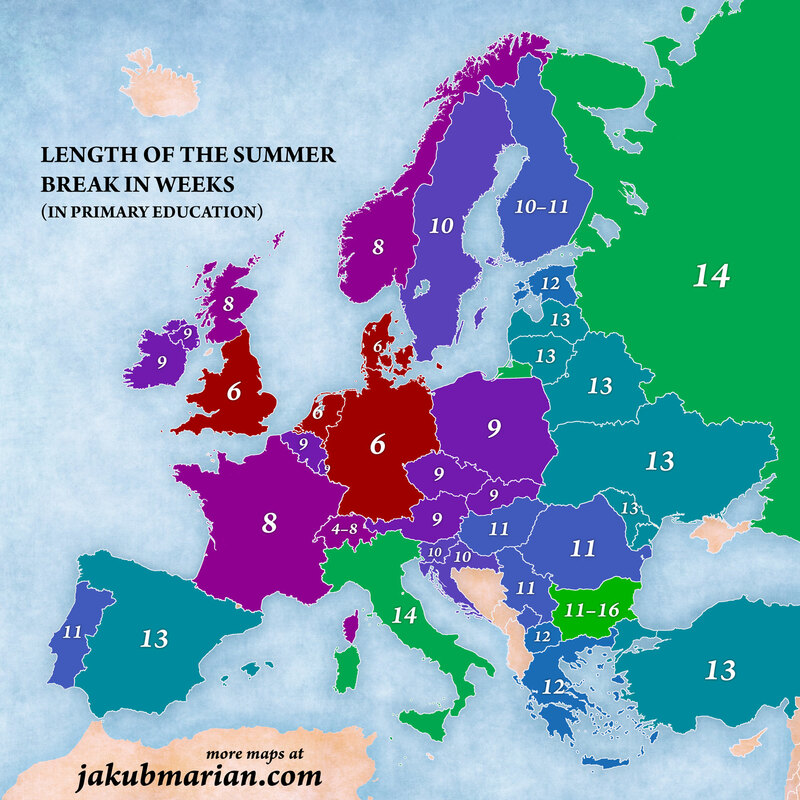 This map researched and created by Jakub Marian accentuates the variation in summer vacations in Europe alone. And that’s not even including the Southern Hemisphere and their summer breaks in December and January! So before you let down your guard, check the vacations in the areas where your clients concentrate. If you’re in the USA but your client base is in Singapore, you’re just starting your vacation as they’re returning and buckling down to work. Additionally, different cultures treat vacation differently. While the proliferation of devices makes “all on, all the time” much more of a reality the world over, some cultures put up higher boundaries around their leisure time than others. Europeans – and Swedes in particular – adhere religiously to their 5 weeks of paid vacation (jealous, much?) They have the ability to let go of the office and work and throw themselves into leisure to a much greater extent than their American counterparts. However you cut it, a significant portion of your target audience is around and professionally active during your summer. Letting your sales funnel chill out with Netflix and Ben and Jerry’s would be a shame since everything would melt. What should you do about it – especially when you’re in desperate need of some down time, too? Automation is a vacation’s best friend. The more you can set up in advance, the more your content and system can work for you while you’re chilling with some New York Super Fudge Chunk. If you’ll be offering discounts, promoting a new release or running major events in the fall, start planning and implementing those campaigns now. Get your website prepped to automatically engage visitors. Write the content. Plan your sales funnel. Set campaigns up to run. Many marketing automation tools can do the majority of the heavy lifting, with some need on your end to check in and optimize. Autonomous (self-optimizing) marketing tools, like CliClap, can do even more with even less involvement on your part. Use your pre-vacation time like a squirrel hoarding acorns for the winter. Think ahead, plan in advance, put in the work… and then press GO. Once you set up a self-optimizing tool, it doesn’t matter if you’re absent. The right content will get to the right visitors at the right time and get you closer to closing deals even while you sip margaritas on the beach. Even autonomous marketing tools can only go so far. For minimal investment products and services, they might be able to get the customer to the point of buying or signing up. For major investments, however, you need a real, live human in the sales role to get the customer to a deal closure. If your “human in the sales role” (whether it’s you or an employee) is going to take a vacation, prepare in advance so that potential deals don’t fall through the cracks. Have a plan for leads that come through at that time. Ensure that someone is the manager for responding to those leads, so they get acknowledgement and a clear sense of when they can expect someone to be in touch with them. You’re ready. Everything is set up, ready to press play. But your vacation isn’t for another three weeks. And traffic to the site has slowed. If you’re around, but business is naturally slower, what should you do with your free time? When was the last time you analyzed your lead scoring model? Can’t recall? That means now is the time. Find all the opportunities won that were generated or touched by marketing. Analyze their engagement and see if you can find some common behaviors (e.g. what channels they came from, which pages and content they visited, what was their first touch and last touch point). When you find common behaviors, give those behaviors more weight in your scoring models. You may even want to fast track visitors who match these behaviors. Once your lead scoring model is all squeaky clean and shiny bright, it’s time to grab a mop and head over to your database. There’s a good chance that this year your database underwent some heavy duty scrubbing before May 25, as the ominous GDPR deadline drew near. If European customers are off your radar screen, though, there’s a good chance you didn’t. But that time pays for itself when it boosts your performance. As time goes on and people change jobs, positions or emails, your list performance will decline. Open rates and CTR drop. You wind up paying your Marketing Automation provider for records that are no longer relevant. Start by exporting all non-customer records that haven’t engaged with you (didn’t open emails, visit your site, attend an event etc.) in the past 4-6 months. Evaluate which ones should be deleted. Start by looking in Google Analytics and see which pages are generating high bounce rates. Think about what you could add to or change in those pages (the content itself, CTAs, recommended resources) that could help your visitors continue their journey on your site. Look for your 404 sessions. 404 pages indicate a user tried to access a page that could not be found. Identify those pages and delete them, redirect or fix the URL. You invest tons of resources on generating great content – blogs, ebooks, case studies, videos, you name it. But when was the last time you analyzed which assets are contributing more to your main goal, or which content drives higher engagement? Start with Google Analytics and build a dashboard that focuses on content performance metrics. Make sure you have goals and set up within Analytics so that you can track conversions and the contribution of each piece of content. Heatmaps can also provide clarity on how visitors interact with your content. Hotjar is a great tool for heatmaps and other visitor insight tools, and they offer both a forever free (but limited) plan and free trials for their other plans. If some of your content resources are PDFs – which are notoriously hard to track – you might consider using a tool like CliClap that can follow visitor engagement and interaction within a PDF (the fact that you lost visitors once they entered a PDF ticked us off for years – so we decided to do something about it). Did that feel like a lot to absorb? We get you – the summer often inspires our brain to go on vacation before our body has permission to get up and leave. So here’s a concise, point-by-point checklist of what to do before your body can run out the door and go join your brain. Plan and implement campaigns for fall events, discounts or new releases. Get your website prepped to automatically engage visitors. If possible, install autonomous (self-optimizing) marketing tools. Set campaigns up to run. Make it clear when the inquirer can expect a response. Analyze their engagement and see if you can find some common behaviors. Give those behaviors more weight in your scoring models. Export all non-customer records that haven’t engaged with you in the past 4-6 months. Look in Google Analytics for pages with high bounce rates. Think about what you could add to or change in those pages (the content itself, CTAs, recommended resources) that could help your visitors continue their journey on your site. Identify 404 pages and delete them or fix the URL. Check your goals within Google Analytics to make sure they reflect your current business and content goals. Build a dashboard that focuses on content performance metrics. Install Google’s Page Analytics Chrome Extension to see evidence of engagement within pieces of online content. Install Hotjar and set up heatmaps to see how visitors interact with your content. For PDF content resources, set up a tool like CliClap that can follow visitor engagement and interaction within a PDF. Well, the time is here. The time is now. Here’s to fun(nel) in the sun! Yonatan is the CEO and Co-Founder of CliClap, a smart, autonomous, inbound lead generation and qualification solution for your content marketing channels.